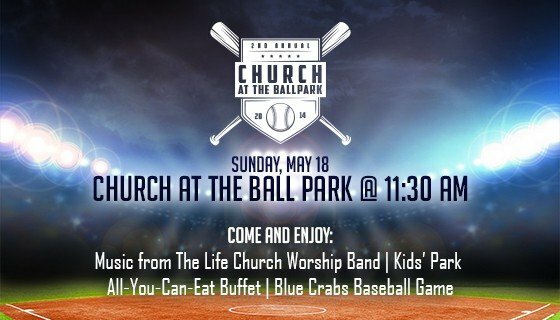 On Sunday, May 18th, we invite you to meet us at the Regency Furniture Stadium in Waldorf, MD, for our Second Annual Church at the Ballpark & Law Enforcement Appreciation Day. The Life Church Worship Band will kick things off under the tented pavilion at 11:30 AM. During the service we will be expressing our appreciation to the men and women who serve within Calvert’s law enforcement community. Immediately after the service we’ll share an all-you-can-eat buffet, including barbecued ribs, baked herb chicken, grilled burgers and hot dogs, sides, beverages, and ice cream for dessert. The private pavilion, located above the left field wall is the perfect setting to watch the game and mingle with friends. After lunch, children will have the opportunity to play on the inflatable games, try out the rock climbing wall, or have a blast in the bumper boats. Sunday’s game is between the Blue Crabs and the Lancaster Barnstormers and begins at 2:05 PM. Tickets are $27.00 for adults and $24.00 for ages 6-12. Children under age 6 are free. Tickets are available from Life Church each Sunday before and after worship, or may be ordered by emailing info@lifechurchcalvert.com. The deadline for ticket orders is May 11. Seating is limited.